DUG Insight is full of helpful techniques designed for you to get the most out of your software. Explore this section to find out more on quick DHI workflows to denoising your stack data. The Structurally-Oriented Filter (SOF) is a great tool for cleaning up noisy data. The result isn’t just nice to look at -- an SOF stack is great for interpreting 2D using the propagator. An important step in building a robust velocity model is to condition the horizons defining the structure. Model building has never been this easy! In this video, we use DUG-Insights horizon tools to tidy up our interpretation and build a reliable velocity model in real time. Are multiple reflections getting you down? Having trouble getting that near stack to tie? If youve got unwanted linear, parabolic or multiple energy, then you can take care of it using this workflow. Using DUG-Insights forward and reverse Radon transform, say good-bye-bye-bye to multiples on-the-fly! DUG Insights Spectral Shaping process is a powerful tool for adjusting the frequency spectrum of your seismic data. From spectrally matching stacks to boosting different frequency ranges, this process is an easy way to condition your data before AVA or AVO analysis! Curvature is a measurement of how sharply bent a curve is at a particular point. In geological terms, curvature is how fast dip changes. Sharp edges have high curvature, and lower curvature implies a smoother, softer edge. Insight can calculate curvature for horizon surfaces or for a volume using a process. When you’re looking for DHI’s, sometimes a simple tool can get surprisingly good results. In the right structure, optical stacking will highlight flat spots and contacts. This workflow generates an optical stack by averaging samples in a direction. It works in time or depth, but it’s best done in depth to avoid velocity effects from shallower intervals. 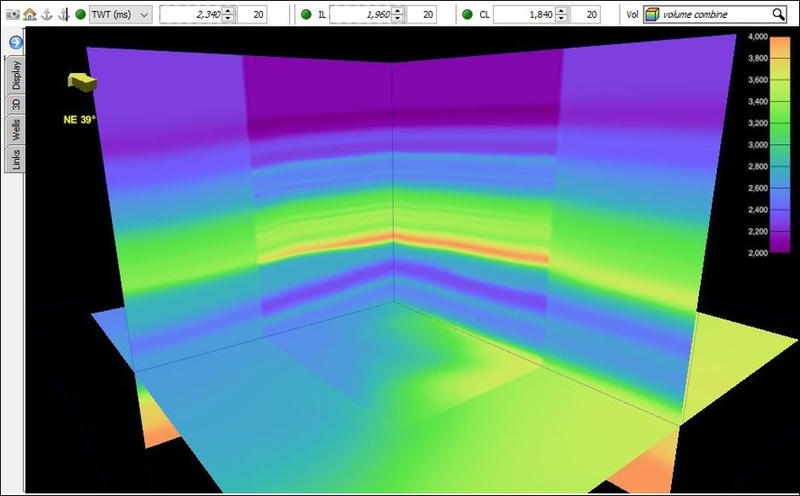 Investigating data using arbline displays is powerful, but they also provide an easy way to create 2D surveys and volumes. This approach is great for saving important sections to share, proposing new 2D surveys, or showing multiple custom lines along a structural trend in 3D. Create lightning-fast QC volumes using DUG-Insight’s volume maths (simple) process. It’s quick to configure and runs extremely fast. In this example, we use it to display the difference between an input volume and an SOF result in real time. Super fast, on-the-fly results! DUG-Insights volume maths tool includes a powerful expression engine. Its easy to use and configure. Discover how to create an enhanced gradient (FNxF) volume, useful for a quick evaluation of AVA. Watch the video to find out about configuring volume maths. Tapered Mutes for Survey Boundaries Quick Tip! We sometimes encounter low fold data at the edge of surveys. The low fold reduces the stack quality in an area extending inward from the survey boundary with increasing depth or time. The Volume Sculpting process is perfect for excluding entire traces based on horizons or polygons… But how do we mute the edges of a stack at varying depths? In DUG-Insight, working with seismic gathers is as easy as using seismic stacks. Apply Normal Moveout Correction (NMO) and remove NMO stretch on-the-fly with only a few clicks, and have everything ready for conditioning or stacking. NMO correction has never been so simple! Seismic surveys come in different shapes, sizes and spatial locations. We will cover two examples to blend seismic, or velocity volumes, together to form a composite of two or more smaller volumes. Both methods use a combination of volume maths, horizons and polygons. Flat gathers are essential for creating the highest resolution angle stacks. DUG-Insight’s RMO workflow easily handles parabolic, non-parabolic and anisotropic residual move-out. Discover the parabolic RMO picker and see how interactive, on-the-fly RMO picking is a complete game changer. This is part one of a series exploring DUG-Insight’s parabolic and non-parabolic RMO correction workflow to flatten image gathers. Flat gathers are essential for creating the highest resolution angle stacks. Part 1 showed how to estimate parabolic residual moveout from gathers using DUG-Insight. Now for part 2, learn how to calculate non-parabolic RMO. It’s the perfect tool for the most problematic gathers! Our series doesn’t finish here, stay tuned for part 3: applying RMO corrections to seismic gathers. In this series we’ve picked both parabolic and non-parabolic residual move-out for our offset gathers. To finish correcting these gathers, we’ll calculate and apply the shifts required to correct our data! Using DUG-Insight’s linked gather views, we’ll do some QC and get a good understanding of the quality of the results.